Student Homecoming Week offers activities for all students to take part, Feb. 9–16, 2019. Embrace your hilltop pride, have fun tailgating, serve with your friends and compete for the Topper Cup. 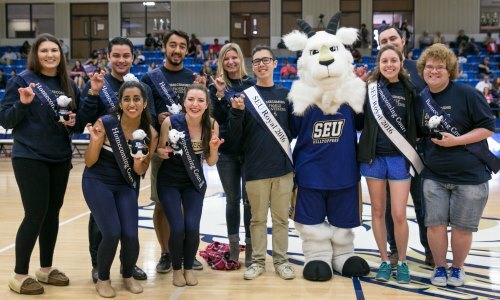 In addition to Student Homecoming Week, students are invited to attend Homecoming and Family Weekend events. Encourage your families to join you for for the weekend, Feb. 15–17, 2019. 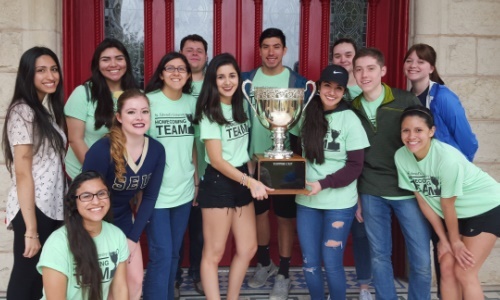 Every year student teams come together to compete Topper Cup glory! Competition events include the Homecoming Service Project, Cardboard Boat Regatta, Board Painting, Fear Factor and more! Create a team or sign up as a Free Agent and be matched with a team. Team Registration Deadline: Wednesday, Feb. 6 @ 11:59 p.m.
Add team members to your roster until the Team Captains Meeting on Monday, February 4 @ 7:00 pm in RCC 231. Nominate someone you know to be on Homecoming Court and run for the chance to be a Homecoming Royal. Or apply to be on court yourself. Candidate must have completed at least 75 degree hours by the time of nomination. Candidate must have a minimum cumulative grade point average of 2.5. Candidate must not be on academic or disciplinary probation. If the candidate is put on probation during the selection process, the candidate will be automatically disqualified. Campus voting will take place Feb 10 - Feb 15. Check out past Homecoming Court and Royals. Celebrate your Homecoming Spirit by participating in Homecoming Spirit Week for your chance to win prizes! Have a vintage Topper Shirt? Can you dress like Topper? Did you make a Topper shirt? Best Topper Tuesday wins. Show up and Show Out at the Spirit Challenge at the Men's and Women's Basketball games! Throw it all the way back to the 2000s, bring out your baggy jeans! Keeping St. Ed's weird in your best representation! Prizes will be awarded daily!!!! Can't make it to the In-Person Contest. Join the Online contest. Each day post a photo of your themed outfit on your Instagram Photo Feed (not your story). Tag and follow @seu_studentactivities and @stedwardsu . Use the hashtag #HilltopHC (so that we see your photo). Post cut off time is 7:00 pm, winner for each day will be posted at 8:00 pm on the Student Activities Instagram account. S.E.R.V.E. 1 Day Homecoming Service Project is a great opportunity for students to serve the local community, learn about Austin and connect with peers. Homecoming Team members can also earn points towards the Topper Cup competition. S.E.R.V.E. 1 Day Homecoming Service Project | Saturday, Feb. 9 | 8 a.m. - 2 p.m. Registration will occur for each individual project and during registration, you will be able to choose from a variety of sites. Breakfast, lunch and transportation are provided for each project, but please do not sign up for projects if you are unsure you are able to attend.